It was opening day morning when I shot my monster. I was walking into the woods to my tree stand when I saw there were deer out in the hayfield. I tried to creep up my tree stand without spooking them because I couldn't tell whether one was a buck or not. When i got to the top of my stand, I must have spooked them because next thing I knew they were running through the woods away from me. As I was watching them run away I was looking to see if one was a buck, they were all does. Then I heard some noise to my left and when I looked over... there he was...a huge buck with ten other does. I slowly put my gun up and watched him. Five or six of the does ended up going towards the creek right across from my woods and I thought for sure that he was going to follow them, but he didn't. I looked down and there was a doe 20 yards from my treestand. I kept as still as possible. The buck was about 60 yards from me eating the brush and grass in the field. He turned broadside at 60 yards, but i was too nervous to take the shot because I did not want to miss. He then started walking down a row of trees towards my treestand, towards the doe. Next thing I know he is 20 yards from me and downwind. I had my scope on him and he looked up and down for what seemed to be like 15 minutes. My arm was so soar from holding still for so long, I thought, "He is going to smell me and its all going to be over." Then the doe started walking away and eating and he took a quick two steps to his left. I pulled the trigger, he ran about 60 yards and went down. I couldn't see him in all the brush so i wasn't sure if he made it across the creek and I missed him, or if he had gone down right there. 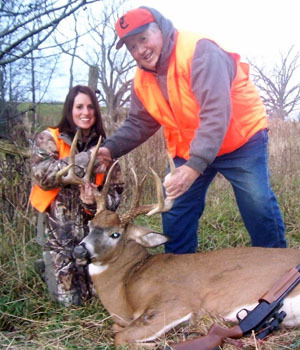 I called up my fiance, Bill, and told him I'd just shot at this monster buck and he told me to sit there until he got down there. Twenty minutes later, Bill made it down to the other side of the creek and saw him lying there. He yelled to me, "Honey, you got him! You got the trail camera buck!" I couldn't believe it! He is a main frame 8-pointer with two abnormal points. We caught this buck on trail camera three weeks before that morning. We also have two years of shed antlers from this buck. I saw him three times during bow and never had him closer than 70 yards until that morning. Gerry Rightmyer scored him 60 days later for me at 144-7B&C. Bob Estes aged him at 5 1/2. 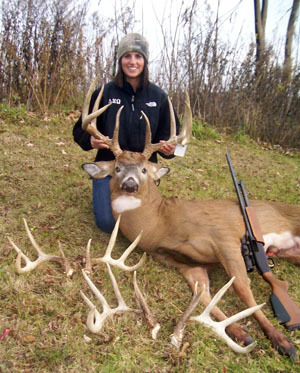 What an amazing buck!